Twitter has announced via its official blog that the new profile setup which includes an avatar and a header photo will be rolled out to everyone on December 12th. Previously only a subset of users had access to the new look. 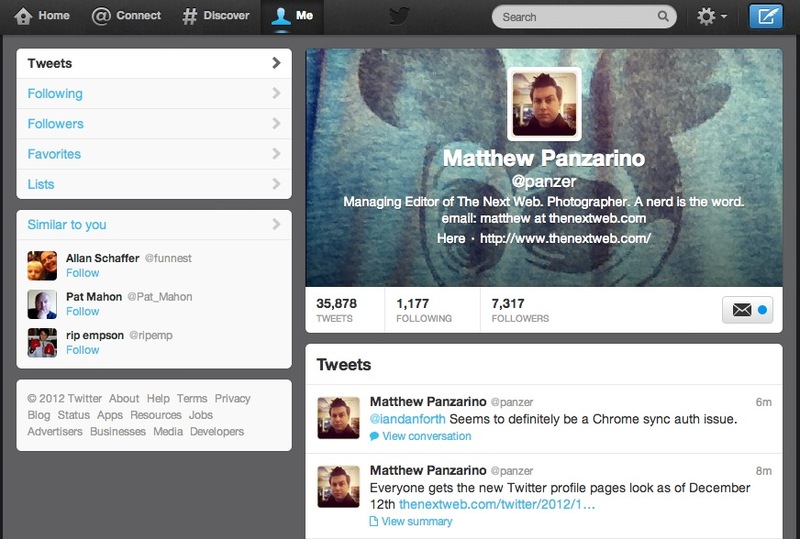 The new profile look features a user’s Twitter avatar sitting on top of a wide header image. Thew new design has made headway into turning your Twitter profile into a ‘home page’ of sorts that displays media you’ve shared, tweets you’ve made and more. Those changes make it feel less like a stream of text and more like a place to collect everything you share. The new profiles were announced by Twitter on the Today Show, an interesting venue for what was arguably an incremental design change. But the shift makes sense, as the pre-profile image design already feels very ‘dry’ and data-base-ey to me when I look at it. If Twitter wants to sell itself as a media service for people, it needs to make it feel much less nerdy.